Ethan Hawke has said that his great-grandmother longed for him to be a priest; he plays a conflicted Christian minister in First Reformed. This isn't just Paul Schrader's best picture in years; it distills his brilliant, erratic career into one magnum opus. It brings together his background in Calvinist theology, his fascination with male sociopathic rage and his scholarly expertise on the austere, contemplative style of filmmakers like Carl Theodor Dreyer and Yasujirō Ozu. If that sounds like a lot to process, don't worry: It's also a hell of a compelling story. Ethan Hawke brings a powerful sense of inner turmoil to the role of Reverend Ernst Toller, a former military chaplain who now leads a tiny congregation at a Dutch Reformed church in upstate New York. The nearly 250-year-old chapel has since been absorbed by a wealthy, well-attended mega-church called Abundant Life Ministries. One of Toller's few parishioners is a young woman named Mary, played by Amanda Seyfried, who asks him to counsel her husband, Michael, an ex-con and environmental activist. Michael, played by Philip Ettinger, is so depressed and frightened by the devastating implications of climate change that he wants Mary, pregnant with their child, to have an abortion. In counseling Michael, Toller opens up about his own experience with grief and despair; the minister is mourning his own son, who died in the war in Iraq after Toller encouraged him to enlist in the military. Their back-and-forth between is a masterwork of spiritual interrogation, in which Toller's urgent plea for hope collides with the full force of Michael's torment. Schrader shoots the dialogue and the entire film in long, measured takes, rarely moving the camera or cutting away unless necessary. In scene after scene he plants us in the room with the characters, forcing us to adjust to the unhurried rhythms of their conversation. But despite its measured pacing and formal spareness, First Reformed has a powerful sense of narrative drive. "Will God forgive us for destroying His creation?" Michael asks, and before long Toller is asking the same question — especially when he learns that Abundant Life, the parent church, is in business with one of the region's biggest industrial polluters. First Reformed is essentially the story of a minister's extreme doubt, disillusionment and radicalization. It doesn't help that Toller has so little to live for: His health is declining rapidly and he's seemingly determined to drink himself to death in any case. His thin, ravaged body becomes a stark metaphor for the dying Earth itself. First Reformed isn't the subtlest of theological provocations. With his explicit references to the Iraq War and climate change, Schrader is implicating modern evangelical Christianity for what he perceives as its lapses in moral leadership and co-opting by the conservative right. The plotting may be a little convenient, but Schrader makes no attempt to conceal the fact that he's written a polemic. It's both a work of deep introspection and a call to arms. The movie isn't undone by these contradictions; it's fulfilled by them. Toller finds himself drawing closer to the kind, gentle Mary, but even that can't stop him from harboring dark and increasingly violent thoughts towards the church. At times, First Reformed suggests a loose remake of Taxi Driver by way of Robert Bresson's Diary of a Country Priest. Schrader even throws in references to Ingmar Bergman's Winter Light and Andrei Tarkovsky's The Sacrifice for good measure. Hawke has said that his great-grandmother longed for him to be a priest; it may not have been his destiny, but he was certainly born to play one. Ettinger and Seyfried are heartbreaking in their vulnerability, and so, too, is Victoria Hill as a church choir director who carries a torch for Toller, but earns only his unbridled contempt. The most surprising performance comes from a terrific Cedric the Entertainer, billed here as Cedric Kyles. He plays Reverend Joel Jeffers, the charismatic but deeply compromised head pastor of Abundant Life. At one point Jeffers tries to get Toller to snap out of his despair, telling him, "You're always in the garden! Even Jesus wasn't always in the garden." First Reformed itself feels like the work of an artist who has spent a lot of time in his own private Gethsemane, wrestling with his demons. By the end of this beautifully sustained movie, it's Schrader's career that's been resurrected. This is FRESH AIR. Our film critic Justin Chang has a review of a new film by Paul Schrader, the 71-year-old director of movies like "Affliction" and "American Gigolo," and the screenwriter of Martin Scorsese's "Taxi Driver." 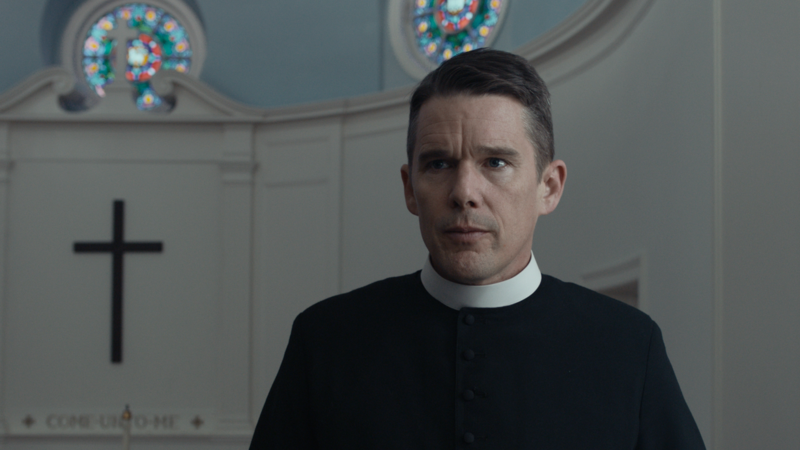 Schrader's new film, "First Reformed," stars Ethan Hawke as a conflicted Christian minister. Justin says it's a spiritual drama that moves like a thriller. JUSTIN CHANG, BYLINE: "First Reformed" is a stunner, a spiritually probing work of art with the soul of a thriller, realized with a level of formal control and fierce moral anger that we seldom see in American movies. This isn't just Paul Schrader's best picture in years; it distills his brilliant, erratic career into one magnum opus. It brings together his background in Calvinist theology, his fascination with male sociopathic rage and his scholarly expertise on the austere, contemplative style of filmmakers like Carl Theodor Dreyer and Yasujiro Ozu. If that sounds like a lot to process, don't worry. It's also a hell of a compelling story. Ethan Hawke brings a powerful sense of inner turmoil to the role of Reverend Ernst Toller an ex-military-chaplain who now leads a tiny congregation at a Dutch Reformed Church in upstate New York. The nearly 250-year-old chapel has since been absorbed by a wealthy, well-attended megachurch called Abundant Life ministries. One of Toller's few parishioners is a young woman named Mary, played by Amanda Seyfried, who asks him to counsel her depressed husband, Michael, an ex-con and environmental activist. Michael, played by Philip Ettinger, is so frightened by the devastating implications of climate change that he wants Mary to abort their unborn child, prompting Toller to share his own experience of grief and despair. ETHAN HAWKE: (As Ernst Toller) So you know my story. PHILIP ETTINGER: (As Michael) You were a chaplain. HAWKE: (As Ernst Toller) My father taught at VMI. I encouraged my son to enlist. It was a family tradition like his father, my father before me. Patriotic tradition. My wife was very opposed. My son enlisted anyway. And six months later, he was dead in Iraq. I talked my son into a war that had no moral justification. My wife can no longer live with me. I left the military. I was lost. CHANG: Their back-and-forth is a masterwork of spiritual interrogation in which Toller's urgent plea for hope collides with the full force of Michael's torment. Schrader shoots the dialogue and the entire film in long, measured takes, rarely moving the camera or cutting away unless necessary. In scene after scene, he plants us in the room with the characters, forcing us to adjust to the unhurried rhythms of their conversation. But despite its measured pacing and formal spareness, "First Reformed" has a powerful sense of narrative drive. Will God forgive us for destroying his creation, Michael asks. And before long, Toller is asking the same question, especially when he learns that Abundant Life - the parent church - is in business with one of the region's biggest industrial polluters. "First Reformed" is essentially the story of a minister's extreme doubt, disillusionment and radicalization. It doesn't help that Toller has so little to live for. His health is declining rapidly, and he's seemingly determined to drink himself to death in any case. His thin, ravaged body becomes a stark metaphor for the dying earth itself. "First Reformed" isn't the subtlest of theological provocations. With his explicit references to the Iraq War and global warming, Shrader is implicating modern evangelical Christianity for what he perceives as its lapses in moral leadership and co-opting by the conservative right. The plotting may be a little convenient, but Schrader makes no attempt to conceal the fact that he's written a polemic. It's both a work of deep introspection and a call to arms. The movie isn't undone by these contradictions, it's fulfilled by them. Toller finds himself drawing closer to the kind, gentle Mary. But even that can't stop him from harboring dark and increasingly violent thoughts toward the church. At times, "First Reformed" suggests a loose remake of "Taxi Driver" by way of Robert Bresson's "Diary Of A Country Priest." Shrader even throws in references to Ingmar Bergman's "Winter Light" and Andrei Tarkovsky's "The Sacrifice" for good measure. Ethan Hawke has said that his great grandmother longed for him to be a priest. It may not have been his destiny, but he was certainly born to play one. Ettinger and Seyfried are heartbreaking in their vulnerability, and so too is Victoria Hill as a church choir director who carries a torch for Toller but earns only his unbridled contempt. The most surprising performance comes from a terrific Cedric the Entertainer billed here as Cedric Kyles. He plays Reverend Joel Jeffers (ph), the charismatic-but-deeply-compromised head pastor of Abundant Life. At one point, Jeffers tries to get Toller to snap out of his despair, telling him, you're always in the garden. Even Jesus wasn't always in the garden. "First Reformed" itself feels like the work of an artist who has spent a lot of time in his own private Gethsemane, wrestling with his demons. By the end of this beautifully sustained movie, it's Schrader's career that's been resurrected. GROSS: Justin Chang is a film critic for the LA Times. Tomorrow on FRESH AIR, Trump versus the deep state. My guest will be Evan Osnos of The New Yorker, whose new article is about how hundreds of nonpartisan civil servants considered not loyal enough to the Trump administration have been sidelined or pushed out of government. Key positions have been left open to an unprecedented degree, leaving the president with few restraints on him. I hope you'll join us. (SOUNDBITE OF BRAD MEHLDAU'S "FUGUE NO. 16 IN G MINOR FROM THE WELL-TEMPERED CLAVIER BOOK II, BWV 885") Transcript provided by NPR, Copyright NPR.